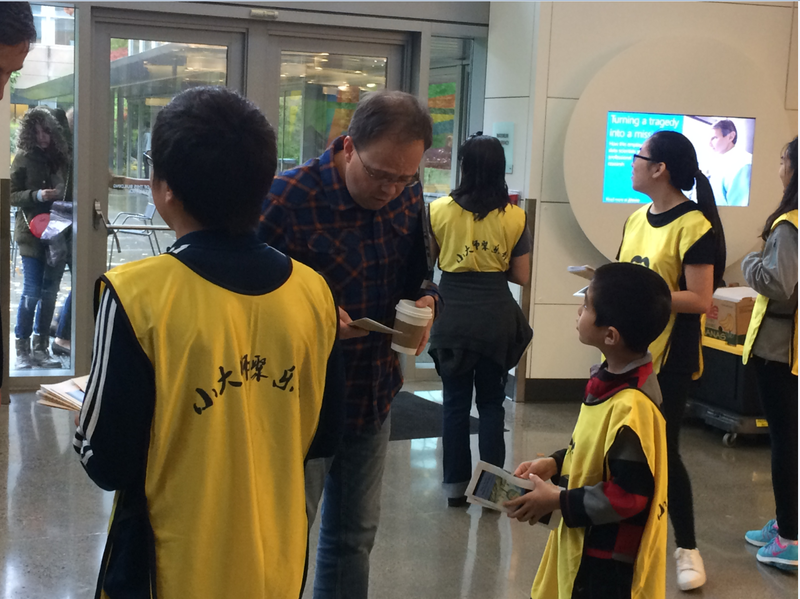 On Friday we joined the other kids in Microsoft for the Gansu fundraiser. The weather was vicious, and there was a typhoon, but it is fun to help the poor in Gansu. In order to persuade people to donate, I had to memorize a script. I memorized the script before we left, at home. It’s really important because without it, you would not know what to say to people! When we got there, I started to help set up the display, then, we folded the flyers (We folded a lot of flyers). Finally everything was set up, and we started to ask total strangers to donate money for us. I started by saying “Hello, my name is Brian. I am a member of the Gansu Education Support Team. We are trying to support kids in China to go to school. We are trying to raise $7000. You can donate in the jar or online. There are also posters over there. Here is a flyer. Thank you for listening.” While talking, I pointed to our poster and lured them to our stand. If they come to our stand, they are more likely to donate. A tip for making people willing to donate is to stay with them all the time, don’t just run away after you finish talking. And, remember to say a lot of "Thank You". The floor was wet from people coming in from outside, so we are not allowed to charge toward people. We all stayed close to our stand. I got people’s attention by waving to them, after they noticed me and walked toward me, I just started talking. I talked to many people, most people didn’t donate. However, some people did donate and it was really enjoyable when they put money into our jar. We also had an option to donate online, some people didn’t have any cash at that moment so they left their name and promised to donate online later. We continued this process for 3 hours. After the lunch hour was over, we counted the money in the jar and found our group got $247. We are so happy!